We know that hackers like to procrastinate. But right now is the limit. This is the last day you can order the Omnibus Volume 2 and have it (most likely) in your hands in time to put one in everyone’s stocking. Tomorrow will be too late. Take advantage of the promo code which expires at the end of tomorrow. Use coupon code OMNIBUS2015 and get $7 off the price. There were 100 of those codes left at the time of writing. What is the Omnibus all about? Check out [Brian’s] explanation of what makes the Omnibus so special. This body of work is a huge achievement and I’m proud that we’re able to recognize the effort of everyone here at Hackaday with something you hold in your hands which will live forever. Last month, we announced a preorder for volume two of the Hackaday Omnibus, a collection of content written over the course of this year that is the best we have to offer. Now, there is a warehouse full of deceptively heavy boxes, and the Hackaday Omnibus Vol. 2 is now in stock. 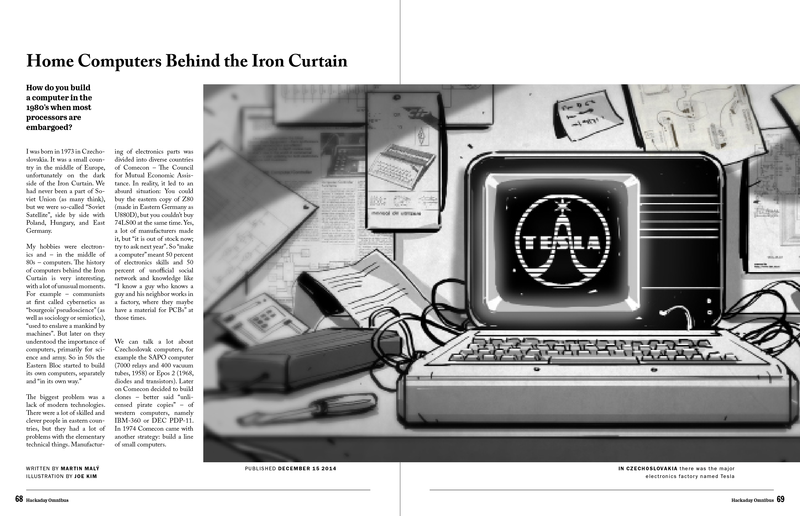 Inside the second edition of the Hackaday Omnibus is 128 pages of actual, real content. There are zero ads, no sponsored content, and absolutely nothing that tells you to go out and buy something. Opening it is an experience unlike anything. Where can you read something for minutes at a time with no interruptions, no email, no Twitter, no Facebook, no text messages, and no ads? You won’t find something like this anywhere else. The electronics, trade, and tech magazines have a long and storied history. In the 1930s, there were magazines that would teach you how to build a radio. In the 1950s, there were print articles saying fusion power was just fifty years away. The Hackaday Omnibus continues this tradition with relevant content for today: everything from car hacking and open source insulin, to retrospectives on oft-forgotten parts of our digital heritage are included. This is the best we have to offer, and we’re doing it without selling out. Volume Two of the Hackaday Omnibus isn’t the end for our print endeavours – we’re just getting started. We’re committed to producing the best content in an interruption-free format. Print is dead, after all, and that’s why we put a skull on it. You can purchase the Hackaday Omnibus Volume Two on the Hackaday Store. 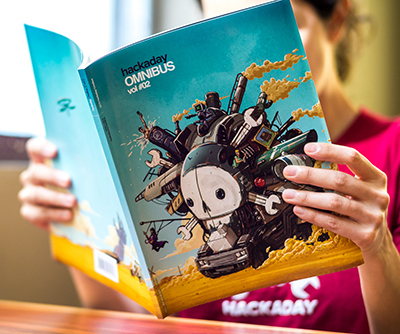 February 9th has come and gone and the Hackaday Omnibus 2014 is now shipping. If you were one of the early adopters who pre-ordered, thank you very much it should be in your hands shortly! If you missed out on the Pre-Order, don’t worry you can still get a copy of your very own but we only ordered a small over-run so don’t wait too long. The Omnibus celebrates the best our writers and illustrators published in 2014 with an 80-page full color volume printed on premium paper. From tales of technology past, to current events, the Omnibus tells the story of what the high points in hardware were last year. We have fallen in love with having a physical version of this content since the proof copies hit our hands a month ago. We believe that this is a conversation waiting to happen — set it out and watch your friends gravitate toward it. We’ve already seen them popping up on Twitter and we’d love to see more. Make sure to Tweet a picture of your copy to @Hackaday with hashtag #hadOmnibus. We’re happy to see any pictures shared, but if you’re one of the lucky souls who works with awesome hardware make sure to take some ‘extreme’ shots. For instance, reading while you wait for the cyclotron to warm up, the nuclear sub to surface, or your ride to pick you up from Amundsen-Scott. This is our first ever print edition and we’ve gone to great lengths to make sure it’s something you’ll be proud to have on your coffee table, bookshelf, or anywhere for years to come. This Thursday a bunch of us are going to be in San Francisco. Come join in for some after-work drinks! Part of the crew that builds the Hackaday.io platform is located in San Francisco and we’re in town working with them. This happens to be just about the time that the 2014 Hackaday Omnibus will start shipping. Come celebrate with us! We’ve been inviting people on social media and are ecstatic about the guest list. We don’t want to call everyone out since this is a casual thing. But for instance, [Brian] somehow got connected with [Dave Grossman] who co-wrote The Secret of Monkey Island and he’s giving one of the lightning talks. You don’t want to miss this! Leave a comment below using a valid email and we’ll send you an invite with the details. Here’s your chance to grab a tangible piece of Hackaday. 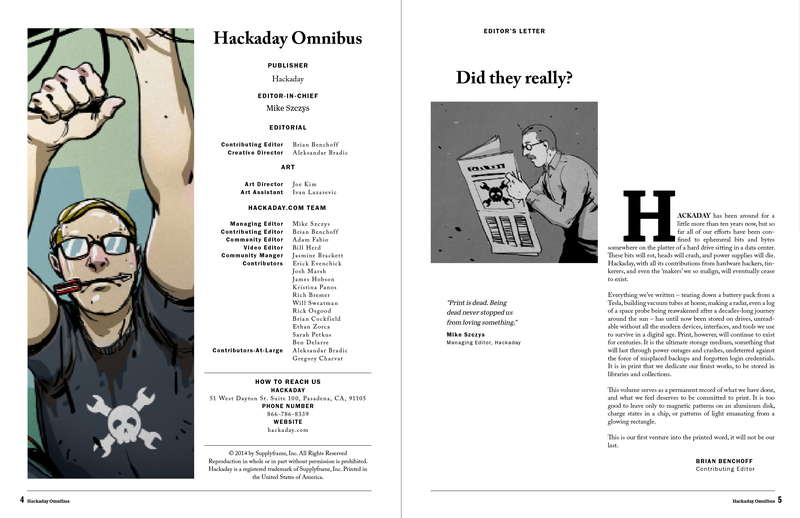 This morning we are starting pre-orders for the Hackaday Omnibus 2014. This is our first-ever print edition. It collects some of the best original content published on Hackaday in 2014. We’re proud of what the Hackaday crew accomplished last year. From stories of old and new to articles that encouraged you to stretch your hacking universe, we are thrilled with the original content articles we saw published last year. To go along with this top-tier content, we added amazing art and illustrations from [Joe Kim]. The product is something that demands commemoration in print and thus the Omnibus was born. This full-color, 80 page, perfect binding volume is just what your coffee table has been crying out for. Of course it will look spectacular covered in solder and clipped resistor leads on the bench. And if your company is serious about hardware you need to send that message with a copy of the Omnibus in the reception area (or comically in the commode). We are pricing the Hackaday Omnibus 2014 at $15 but we will sweeten the deal if you get in on the preorder. Use this coupon code to get $5 off: OMNIBUS2014. The coupon will work for the first 500 copies pre-ordered with an estimated shipping date of 2/9/15.